Imagine you’re out fishing in your favorite lake with the best rod you had just bought recently and the best bait that has arrived from your new online shipping. However, you haven’t been able to catch a single fish. For some reasons, it feels as if the fishes are all hiding from you. You peep into the water only to find that the water is too murky for you to see through. You can’t seem to figure out whether the fishes are out near the shore or towards the middle of the water body. Even though you can’t see the fishes, you know they are right there. In order to get a view of them, you should invest in the best depth finder. This simple gadget can help you find where the fishes are hiding it. If you haven’t heard of this device, you are seriously missing out a lot in your fishing life. This incredible device can help you locate and find the fish from the location where you are. It’s able to scan under the waves and precisely identify where the fishes are. It can even tell you the temperature of the water and how certain deep spots are. So, ladies and gentlemen, this article on the best depth finder will help you guide through the best and we hope that you find what fits your needs. You will be thrilled to find out about some of the most amazing things that these depth finders could do. 10 Best Depth Finders Reviewed! Kickstarting our list of the best depth finder with the HawkEye DT1B Depth Trax 1B is probably the only thing we could think of. That’s because this depth finder is crowd favorite. What’s more helpful about this device is that you have the freedom to choose how you want to set it up. Cool, right? Moving on, you can be free to decide it whether you want to glue it on the hull or make use of the transom mount feature. The finder can offer readings from 2.5 to 200 feet and provide translations in meters if you think that’s easier to understand for you. It’s worth mentioning that no matter how fast you travel on your boat, the finder will give you accurate readings. It’s able to handle speeds of up to 63 miles per hour, unlike the modern-day depth finders. There’s absolutely no delay in its readings; it’s now and exactly right now. The HawkEye DT1B Depth Trax 1B has gone an extra mile with their adaptive software programming works that reduce the false readings and signals that the device may receive. In fact, it’s equipped with a three-stage depth alarm. The device will tell you if you are roving towards water that’s treacherously deep or dangerously low with plenty of time to spare. And it’s worth highlighting that the device is heavy-duty and incredibly long-lasting, even in saltwater conditions. It has a display of 1.65-inches long that makes it easier to read the measures. To sweeten the deal furthermore, let me tell you that the Depth Trax 1B has an excellent two-year warranty, that provides excellent coverage for most instances. When it comes to depth finders and fishing GPS technology, there’s nothing better than the Humminbird407860-1 HDR650 Digital Depth Gauge. Why? That’s because it delivers the best functionality and seamless experience for fishers. Starting from its display, it’s 1.25-inches, which is quite large and comfortable to read off the numbers from it. The numbers are pretty clear and understandable, and that’s what matters. Plus, this depth finder is convenient. 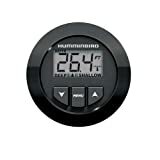 The Humminbird 407860-1 HDR650 has taken its design into a premier level. Its sleek design along with the features create an even better user interface. And you can make use of it without having to worry about it at all; it’s 100% waterproof. In terms of capability, the depth finder can go as deep as 600ft without any issues. You will really enjoy that this tool can track the bottom up to 70 MP. And if there’s anything suspicious, it will send you signals. Therefore, it doesn’t matter how well equipped or less equipped your vessel is, the Humminbird 407860-1 HDR650 is a good choice. All around, Humminbird itself is a high-quality tool for aquatics. It’s simple, reliable and a pretty good tool for the price that it comes with. Moreover, it makes high-quality fish finder for beginners. There might be merely lacking in the features that advanced level fishers might be looking for. Well, this is one is only for novices. 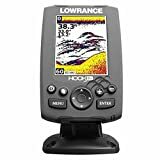 For those who are looking forward to an ultimate fishing experience with top technology, here we have the Lowrance 000-12635-001 Hook-3X Sonar, W/ 83/200 XDCR. It’s mainly designed for inshore fishermen, but when it comes to graphics, depth, and temperature, it’s amazing! The tool may not have a GPS technology, it’s an excellent buy for the price that it offers. The 3.5-inches LED-backlit display provides a magnificent view from all angles. Instead of the fish arches, it displays the fish echoes as signs. This depth finder is very compact. It has 11 controls on the front that includes a keypad, menu setting, frequency changer, zoom keys, and power button. Moreover, this depth finder has the sensor to distinguish objects by setting apart weak and robust echoes. Hard and soft returns are displayed by red, yellow and blue colored lines. You have the freedom to adjust the ping speed according to the velocity of your boat. So, you can control the interference coming from other transducers. It easily supports 200 kHz and 83 kHz frequencies that’s adjustable from the frequency key. The hook attached with depth finder also includes track and alarm options. With that, we can say that we’ve chosen an excellent featured tool that comes at an affordable price and excellent ratings from consumers. Humminbird provides world-class quality products, and the PiranhaMax 197C is no exception. It has some robust features that fit into the budget as well. With so much more, this fish finder is a total attention grabber. First off, this depth finder has the technology that can determine the depth automatically. It can auto-adjust itself to keep fish and the bottom visible on the screen. On top of that, the sonar technology sends sound waves from its transducer out into the water. It detects objects while the boat is moving. Amazingly, the sonar view shows a different intensity of colors. Plus, the Dual Beam sonar uses a 200/455 kHz frequencies with a 28-degree conical area coverage. Speaking of the display, it has a 3.5-inch thin-film-transistor TFT screen, the resolution of which is 240H x 320V. Okay, now we’ll be very honest here; the display maybe not have the highest quality image, but it’s way better than what competitors have come up with. But the good news is, you can change the contrast settings and zoom and in and out as per your convenience. The LED backlight compromises better visibility. So, you won’t have to squint to see your target. Other than that, the fish finder has the fish alarm, which makes a little sound when the sonar picks up a fish. So, you can already see that this device is unique can quite useful for any angler. The Lucky Fish Finder will definitely change your luck! It’s very adaptable and portable that just fits your needs. There are an array of functions that you can try in simulation mode and then go fishing in transducer mode. Or for fishing, you can use the depth sounder in a number of ways such as river fishing, sea fishing, ice fishing and so on. The brackets help you to attach the transducer on your boat. The sonar transducer of the kayak fish finder gives you 26ft wired operating distance along with a 45-degree detect angle and 328ft depth finder. You’ll love the various features that it has. There are three types of display that you can choose from; clearer and more professional. And of course, you can set up the sensitivity, brightness, depth range, depth alarm, zoom, and fish icons and set your preferred language. Take a look at its TFT color LCD screen, and you will be able to detect and see underwater depth, temperature and fish size. You will be satisfied at how instantly it scans the area and sends an update to the handheld unit. The Lucky Fish Finder is rechargeable and comes with a USB cable that helps in charging. The handheld depth sounder is able to last for approximately 5 hours with a full charge in it. We highly recommend the Lucky Fish Finder as it’s very reliable. Not only will you be lucky to have it, but also smart to own it! Vexilar Inc. Hand Held Sonar is not just a depth finder. It’s an addition to your fishing and diving experience. This handheld depth finder comes in very handy. It’s equipped with a 200 kHz in-built transducer that’s able to read depths between 1.8 to 200 feet. You can use the device while you are in the water and still get flawless performance. It’s 100% waterproof for up to 150ft, which makes it an ideal tool for snorkeling and scuba diving. It even performs excellently when used for ice fishing. Remarkably, this device float on water. So, even if you accidentally drop it into the water, it will bob on the water surface, making it easier for you to pick it up. And the neon yellow color helps you clear a clear view of the tool, no matter where it is. The display might be a little small, but you can still view the measurements without any trouble. After all, what more can you expect from a handheld device that runs on 9V batteries? The display auto-shuts every 10-seconds to conserve battery charge. However, the backlit display is quite useful, especially at night. Consider this depth finder to be your life savior. Make every fishing expedition a triumph with the Vexilar Inc. Hand Held Sonar. Reliability, accuracy and simplicity; the Lowrance LST-3800 In-Dash Depth and Temperature revolve around these three words. This is more compact and a unique version of theLowrance 000-12635-001 Hook-3X Sonar, W/ 83/200 XDCR that we had reviewed previously. With the use of the Lowrance LST-3800 In-Dash Depth and Temperature, you are more likely to get an accurate depth and temperature instantly. The tool measures down the temperature nearest to 0.1-degree Fahrenheit for the best accuracy. You would be surprised that this compact design of a depth finder is able to measure down to 700 feet. With the shallow water alarm, it will make things way more comfortable. Alongside, the external buzzer will not cause you any trouble. The standard compact case can fit into a standard 2-1/8-inch diameter gauge hole for convenient mounting. Now coming back to the display, it has a high-contrast dot matrix LCD display along with advanced white LED backlighting. This makes it very easy to read. The screen shows three main features – temperature, dual screen and more importantly the depth. You can go about 40-45 mile per hour in your boat and still get a reasonably well reading. So, you won’t have any issues with speeding either. Overall, this depth finder works really well under any circumstances. One more thing that we’d like to say in conclusion is that it’s an excellent tool for diving, especially with kids. It will help you instantly know the depth of the water. The HawkEye FishTrax 1X is an advancement in the next level. 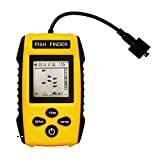 If you have bought other fish finders and still failed to track and catch your preys, this tool is going to be very useful. We would strongly recommend you to purchase this, and if not then at least consider it in your list of fish finders. For some anglers, it could be terribly difficult to read and understand from the display. However, the HawkEyeFishTrax 1X has the dot matrix play that delivers a clear view of the screen and a summary of what’s going on underwater. If you’re looking for something portable, rather than permanently mounting on your boat, here’s your solution. This small-sized depth finder is perfect for you to bring whenever you go fishing, diving or other watersport activities. The tool comes with an intelligent sonar that’s used to come up with all the other metrics. The dual frequency sonar in the device helps to show you some of the vital facts that you need to know. This enables you to ensure what approach you should follow to catch your fish. You’re definitely going to get perfect results if you head out to buy one of the HawkEyeFishTrax 1X. Whether you use it to find fish or measure the water depth, it’s going to be so much better with this one. The Faria Marine 13852 Chesapeake do need a lot of time and dedication to set it up, but once it’s done, there’s nothing better than this. However, for your convenience, it does come with its transom mounted transducer for you to begin your installation process ASAP! Moving on, this depth finder is capable of a finding of 199ft. 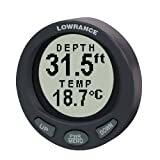 And the most significant advantage of this depth finder is that it has a considerably larger display, which allows you to gauge the depth with just a glance. It has a backlit display, which is relatively visible during both day and night. It also has the keel offset setting, which means you can customize your settings as per the needs of your vessel draft. 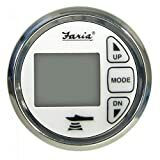 The Faria Marine 13852 Chesapeake has an automatic control. This means that whether the signal is active or too weak, the results are going to remain the same. You will get the most updated and reliable readings about the water. However, the wrong side of this depth finder is that if you put it in deeper water, it may not function very well. This portable depth finder is impressive. That’s because it can identify and visualize short and tall weeds, water depth, fish locations and rock and sand on the seabed. This is an updated version of all the previous devices that the manufacturers had created, and this is indeed so much better. The Venterior Portable Fish Finder can be used in lakes, seas, rivers or any other fishing habitats. It works great at a depth that starts from 3ft to anywhere around 328ft flawlessly. In addition, it has a circular transducer, which has 25 feet of cable with a removable transducer float. Moreover, it comes with some unique features like battery saver mode, backlight mode and up to 5 users’ selectable sensibility. Do take note that it measures the depth of water in terms of both meters and feet. With no more than a two-years of warranty, you can return it in any case of manufactural defects. So, what are you waiting for? Get yours now! Of course, you will be looking at a number of different depth finders, its features, and functionalities. However, you need to look for a few factors that are a must. Therefore, we have combined the main things you should look for in a depth finder. Mainly, if you are planning on using your depth finder solely to find fishes, sensors are a must! Basically, a sensor is what sends out and receive the sonar waves. Once these waves are emitted into the water, it bounces off to find different objects under water. Eventually, they get picked by the transducer. When it receives the data that it needs, it directly goes into the central unit. The signals then get processed into a picture and appear on the display for you to see and understand. Transducers also come with different types of mounts, the easiest one of which is to install the transom mount. However, if you have a bigger boat, you will be needing something much seriously; perhaps something like the thru-hull mount. What type of boat will you be using? Depending on that, you need to choose the right transducer material. For hobbyists and recreational fishermen, a plastic transom would do the job. They are compatible with all types of boats. On the other hand, if you are using a transducer with a thru-hull or an in-hull mount, metal hulls or fiberglass need plastic housings. Aluminum or steel hulls need the stainless-steel housings. Bronze housings are more necessary for boats with fiberglass or wood hulls. Lastly, when it’s about recreational users, most of the fish finders come well equipped with trolling motor transducers with transom mounts. The good thing about this is that it works with any kinds of boats. You will just need to ensure to follow the installation guidelines thoroughly. But if you still think that the idea of a thru-hull transducer is better, then your choice is between bronze and plastic only. Of course, color displays look better on all electronic devices, not just depth finders. They uphold plenty of details and offers up to millions of colors. Whereas a black and white screen only has 265 shades of grey. Plus, black and white screens are harder to be read under sunlight, dark and cloudy weather. Colour screens are easier to understand and learn. 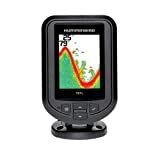 If you can’t seem to fit a color display depth finder into your budget, you might just have to choose a black and white one to get started with. In addition, if the device is merely just to get a simple idea about the depth and find a few fishes, then a simpler model would be better to start with. You can always upgrade later. Here’s a little though you need to put in: you need to consider what resolution and how many pixels your depth finder’s screen needs to have. In simple words, a pixel is just a dot on the screen. The more pixels you have, the more details the depth finder’s display can put out. For instance, with a 320 x 320 resolution, 320 dots would be going from left to right and 320 dots going from top to bottom in each column. What we’d suggest is that you should at least go for 240 x 160 pixels, if it’s your first time buying a depth finder. Even this might give you the feeling that you are playing Tetris instead of looking for fish. If you have a little extra budget to spare, always go for a better resolution display that’s more likely to give you nice details and crisper images. It’s totally worth it! In tune with the screen size, the resolution of the depth finder will decide if the picture of it is going to be good. Most cheaper devices have smaller displays. They make good backup options. 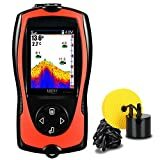 But if you are seriously looking for a fish finder, which needs to sustain for long, you need a bigger budget, larger display, and better-quality screen. Only then you will be able to view the numbers and data on a bigger screen. Some small screens sometimes even get cluttered up! Before you jump on to pulling the trigger, you need to know the power of the depth finder. If you want a device that has faster and deeper readings, you need a high wattage unit. Devices with lower wattage are likely to be slower and are more applicable for shallow water. This usually occurs because a depth finder converts sonar waves from its transducer. When there is less power, the waves are slower, and hence the reading is also not reliable. When there’s more power, the readings turn out to be more accurate. Long story short, if you plan on going fishing in shallow water, you don’t need a powerful depth finder. But if you prefer deep water or saltwater, you need to get a device that can afford much power. Your depth finder will show depth readings of up to 400 feet with every 100 watts of power at 50 kHz. Your depth finder will read up to 100 feet with every 100 watts of power at 200 kHz. Most depth finders in the mid-range operate with dual frequencies, which helps you to see readings from every spectrum in a split-screen mode. Last but not least, you need to consider water resistance. Why? That’s because if you plan on mounting it on an open vessel, chances are it will come in contact with water. In that case, check the IPX or JIX ratings that determine the device’s resistance to water. If it has a rating of four out of five, it means that the device is safe and water splashes won’t have any effect on the device. Consider yourself lucky if your device has a rating of seven because it means that you can sink your device for a good 10 – 30 minutes and there’s not going to be much of a problem. The rating makes a huge difference. Just like any other gear, you need to pay close attention to details when looking for your depth finder. These devices are all very well advanced and equipped to last you years with proper maintenance. If you invest a decent amount on it, you will find an excellent 3D mapping, charting, scanning and navigation features. It’s not like you have to spend hundreds unless you really want a high-end finder. Also, don’t forget to look for products that are easily upgradable (both hardware and software). As we had mentioned before those multi-screen finders make your fishing experience so much better, in tune, you also need to pay attention to the power output in watts and the clarity and size of the display. If all goes well, the brands that we have mentioned are all excellent. Lowrance, Humminbird, HawkEye and so on. All of them have rugged construction with a basic operation that provides stress-free performance. Choose your device carefully and enjoy all your time on the water!